John Haldane, Earl of Strathairn, is on an urgent mission to find the killer of his fellow spy. After visiting the young widow of one of his agents, Strathairn strengthens his resolve. A spy should never marry, and most certainly not to Lady Sibella Winborne, with her romantic ideas of love and marriage. Unable to give Sibella up entirely, he has kept her close as a friend. Then, weak fool that he is, he kissed her. Lady Sibella Winborne has refused several offers of marriage since she first set eyes on the handsome Earl of Strathairn. Sibella’s many siblings always rush to her aid to discourage an ardent suitor, but not this time. Her elder brother, Chaloner, Marquess of Brandreth, has approved Lord Coombe’s suit. Sibella yearns to set up her own household. She is known to be the sensible member of the family, but she doesn’t feel at all sensible about Lord Strathairn. If only she could forget that kiss. Once the family returned to Brandreth Court, their townhouse in Eaton Place, Sibella faced another dizzying round of social events. She and Maria took an afternoon off from social calls to view the Parthenon sculptures at the British museum. “Strathairn?” Sibella said. Her heart raced as the tall fair-haired man crossed the road just as their cab drew up behind a town coach. “Maria!” Sibella hissed as her cheeks began to burn. He turned his head and changed direction, coming to their carriage where they’d stopped in traffic. “Really, Lord Strathairn, do you think shopping is all we ladies do?” Maria asked in a teasing voice. “Yes, it certainly can be,” Sibella said. He bowed again. “Then I look forward to seeing you there.” At a shout from a drayman, he dodged a wagon and ran to the pavement. Maggi Andersen fell in love with the Georgian and Regency worlds after reading the books of Georgette Heyer. Victoria Holt's Gothic Victorian novels were also great favorites. She has raised three children and gained a BA and an MA in Creative Writing. After husband David retired from the law, they moved to the beautiful Southern Highlands of Australia. Maggi's free time is spent enjoying her garden and the local wildlife, reading, movies and the theatre. She keeps fit swimming and visiting the gym. Maggi is a multi-published author, and writes mysteries and young adult novels as well as her Georgian, Regency and Victorian romances. 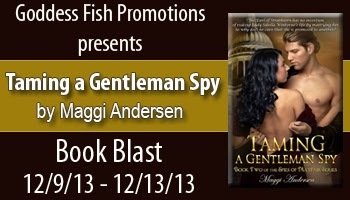 Giveaway Information: Maggi will award a $50 Amazon GC plus an e-book copy of A Baron in Her Bed – The Spies of Mayfair, Book #1 to a randomly drawn commenter during the tour. Thanks for hosting me, Dawn.